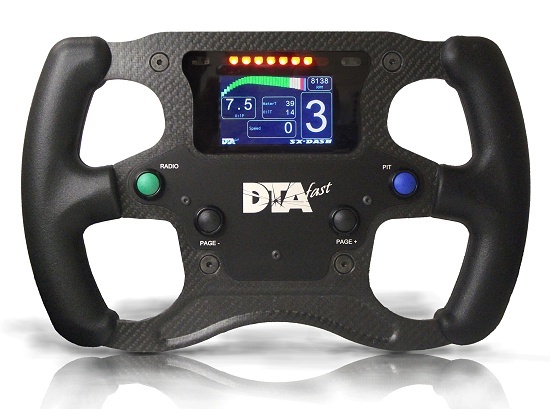 Made of a high quality aluminium/carbon mix this steering wheel combines light weight with strength. The experience we have acquired during many single seater championships allows us to increase the reliability of our products. The structure of this steering wheel enables the integration of numerous functions in order to adapt its use to various categories. Choice of the number of paddle shifters: 2 to 5 paddle shifters depending on its use (gear selection, DRS, radio, clutch). Choice of the number of push buttons: it is possible to have 4 to 6 control buttons on the front plate, with or without protection. Choice of the number of rotary switches: 3 rotary switches of 2 to 6 positions can be added to the front plate. Choice of the type of electrical connection: it is possible to choose between an output on spiral loom or by integrated connector in the steering column depending on the characteristics of the vehicle. Choice of push button labels: it is possible to choose the labels, the size and the font of the laser engraved markings on the front face of the steering wheel. Customisation of the front face: it is possible to laser engrave your logo or an image of your choice on the front plate so that your steering wheel is unique. New generation integrated 3â€ or 4â€3 colour screen ensures exceptional readability whatever the luminosity. This steering wheel incorporates a new generation screen, a 400×240 pixel transflective colour screen which ensures an exceptional readability whatever the surrounding light conditions. The 16 available pages are configurable by the user and via a USB connection and the sx conf software provided. 8 RPM leds et 4 alert diodes at the top of the screen are also configurable to better adapt to the userâ€™s needs. Temperature range : â€“10Â°C to +70Â°C . Voltage : 9.4V/18 V, 500 mA.